Okay, please indulge my personal curiosity. This is going to be an interactive post—there’s a pop quiz for some readers. I’m 22 days and 8 or so hours—give or take—from my next PSA test. (But who’s counting??) And anyone who’s been diagnosed with prostate cancer already knows that there’s a ton of infuriatingly conflicting and confusing information about PSA out there. Below what PSA level does your medical team say PSA is “undetectable”? At what PSA level does your medical team say that biochemical recurrence has occurred? If you had biochemical recurrence, how long after hitting biochemical recurrence was it before you began salvage therapy? Seriously, having this information available when I get my next PSA results may help me with the next conversation that I have with my medical team, so I thank you in advance for helping me understand what may be next for me. I’ll share the results in next month’s post which will be shortly after I receive my PSA results from my 2 August 2017 blood draw. I’ve been blogging for the last 80 months to maintain my own sanity, educate myself and others, and to increase prostate cancer awareness. I certainly don’t do it for recognition. I have to admit, however, that I was surprised to see my blog listed on a Top 50 Prostate Cancer blogs list by Feedspot. I don’t post this to feed my ego (much), but by clicking on the image below, you’ll see the other websites and resources that are available as well. I filled out your survey but question 1 would not let me put an answer in in any numerical or worded format. My answer to Q1 is <0.05 ng/ml, I even tried it as "Less than zero point zero five ng ml" but it wouldn't take either. Thanks, Eric. I’ve opened up the survey to all answers. Thanks, too, for sharing the article. I can understand the appeal of alternative approaches given all the potential side effects of treatment options. I wish you well. Thanks Dan, I like the survey idea, but please keep in mind we are all different and no one size fits all. My PSA seems to double at 4-5 weeks when it gets going. Fast dividing cells are targeted by chemo, so maybe that will be an advantage. My diagnosing uro gave me 15 years. That was 9 years ago. I was shocked then, but now I hope he was right! I wonder how long I have left while hoping for a miracle! S and I attended a healing service last week. I put my hand up and received prayer and anointing. It gives me hope, stranger things have happened. Best wishes for your journey. Thanks. I agree about each case being unique and that the answer for your case won’t fit my case. I think, more than anything, I just want to see/show the diversity of information that’s being shared. My own medical team seems to poo-poo more recent studies showing alternate views to their own. Perhaps I’m trying to gauge where my team fits in with all the others. No one has all the answers! It’s a crap shoot however you look at it. As you well know, you have to be your own researcher and advocate. I didn’t have a prostatectomy. Instead I chose brachytherapy with contour external beam radiation. My PSA was at about 3 after we were done. That apparently isn’t unusual. When it rose to 5 I had an MRI and they found found 3 spots on my spine. Thanks for your comment, Jim. How are things going with you? In your last update, you mentioned your struggles with changing meds and managing side effects. I hope you’ve been able to strike a tolerable balance that’s added more “good hours” to your day while slowing the progression. Getting my meds straightened out is a continuing battle. I’m on the third set of drugs. Fortunately, this set appears to be working very well. I’m just at the start of the taper down on the problem drug. It will take two more weeks before I really know. Thanks so much for asking. I’ve been very remiss in my updates. I need to post something soon. Glad to hear. Not to worry on the updates. You have bigger fish to fry at the moment. Just answered your survey and added a comment there, but thought I would leave this here too. My PSA never went away after my surgery (almost exactly a year ago) and even went up 3 months later. First post-op PSA was .2 and then went up to .6 about 3 months later. A Decipher (brand) genetic test after the first PSA came back as “High risk” for metastatic disease. Then the increased PSA a couple months later. So the urologist wanted some significant salvage therapy right away (ADT and radiation). It seems to be working since the PSA is undetectable 6 months later. 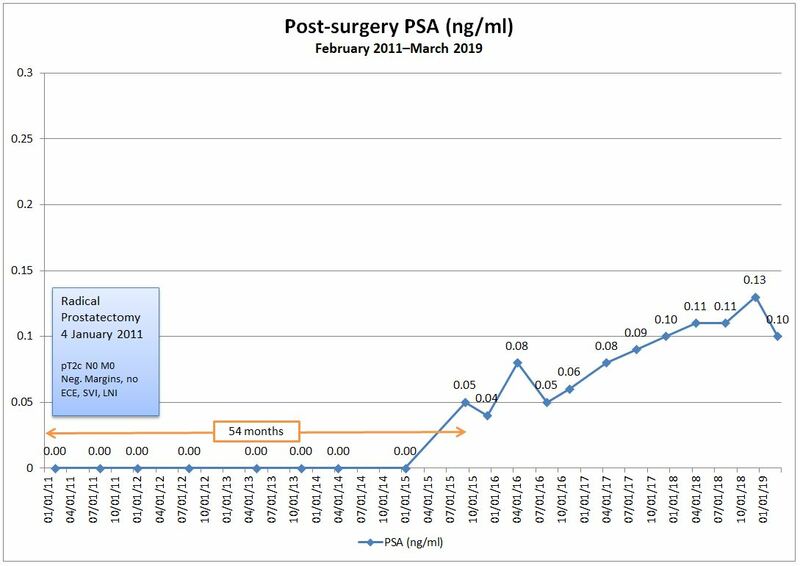 I’ve been reading a lot lately, as you can imagine, and I’m gathering that waiting for a rise to 0.2 is kind of “old school.” I have a younger friend (I’m 66 and he’s 56) who had surgery 2 years before mine and his PSA never got below about 0.05 and gradually rose over 18 months. When his got over 0.1 they started him on salvage therapy. It seems the steady upward trend is more important than waiting on that .2 fixed number. If you haven’t found it already, prostapedia.com is a terrific resource. Single topic journals, doctors interviewing doctors. Would be glad to share more info. All the best…. Thanks, Patrick. Your comment about “0.2 is kind of ‘old school'” resonated with me. Like you, I’ve done considerable reading and newer studies are indicating taking action earlier in a PSA rise. Thanks, too, for the Prostapedia resource. I’ll start following along. Well done on getting your top 50 award. Hope your survey turns up some interesting perspectives. Thanks, Tim. Looking at early responses, it has been interesting. I’ll share the results next month. I didn’t fill in the survey because I’ve got my surgeon on my medical team who says undetectable is .05, and that he does nothing until it hits .1, at which time he does scans. But my RO, who I went to see on my own, saying he would consider BCR and treat once he sees a clear trend and doesn’t believe in a cutoff. I was <.02 until,the 2year mark when my PSA came back at .02. Then 5 months later.033 at a different lab. So not sure yet, but I think I'm heading in the same direction as you Dan. I should have added that not pathology isalmost the same as yours Dan. PSA at diagnosis in November 2014, 4.2 post surgical pathology in January 2015, upgraded to g7(3+4), negative FINAL margin, negative lymph nodes (9), negative SV. My surgeon did frozen section which showed positive margin sorry cut more to get my negative final margin. When I lost my <and went to .02, my doctor at Mount Sinai ran the PreciseMD test that you mentioned in your blog it came back for out of five data points favorable. I also had to decipher test which came back at 37%, so low risk. And yet it seems like I am heading towards possible BCR. Very confusing. Thanks for sharing your story and your numbers, and sorry to hear that we’re headed down the same path. I was reading a post from a gentleman in the Facebook group that he’s starting RT at 0.03 after surgery 6 months ago. The timing in his case may make it more adjuvant RT instead of salvage RT. Each case is unique and different, that’s for sure. I go for my next PSA on 2 August, and we’ll see where that takes me. Thanks again for sharing. All the best to you. it 3 a.m uk late!! But as just diagnosed at 56 with Prostrate Cancer after recent biopsy and cant sleep as very worrid / scared etc !! PSA 3.6 started Doctors concern few months ago that lead to recent biopsy. Told it non aggressive at moment Gleeson Score 6. 3 Radioactive seed type put in procedure. Seems in USA there a MRI guided laser that treats the tumours but not killing the good tissue that I wish we had in England as sounds the way ahead!! As my big concern is the quality of life afterwards ie incontinence, ..erectile problems so have for the moment put myself on Surveillance mode pending next PSA test. So be really grateful for a steer / advice what to do as sick of worry now and head spinning. Thanks for your comment and sorry to learn that you’ve joined this club that no one wants to be a part of. I certainly can relate to the head-spinning part of this whole process right after diagnosis. The good news is that your PSA and Gleason scores are low which gives you time to research your options and make a decision that’s right for you. Our numbers on diagnosis are similar and, in retrospect, I wish that I had taken more time with my decision. I was diagnosed on 10 November and had surgery on 4 January. That’s pretty fast. I don’t know that delaying my decision another few months would have made me select a different option, but I think I would have been better educated about it all. I wish I could tell you what to do, but I can’t. The only thing that I’m an expert in is my own experience. Keep in mind that others who have had a prostatectomy have faired better than I have and some have faired worse. Each case is unique, and only you can assess what your priorities are for quantity of life and quality of life and your tolerance for the risks associated with each form of treatment. I have a desk job so the minor stress incontinence that I experience during a cough or a sneeze is a nuisance. But if I had a more physically demanding job, the stress incontinence that I experience when lifting heavier objects would become problematic. I’m single so the erectile dysfunction that I experience is less impactful than if I had a partner. These are the sorts of things that you should be asking yourself and how they apply to your specific situation. You also have to be comfortable with the success rates of each of the procedures you’re considering and the risk of recurrence if the primary treatment fails. My surgeon told me in the initial meetings before the surgery there would be a 20% chance of recurrence. Lo and behold, I fell into that 20% group about 5 years out from my surgery. I know it’s easier said than done at this stage, but take a few moments to breathe and then keep doing what you’re doing—get multiple opinions from doctors and patients who have had each kind of treatment, and then make the decision that’s right for YOU and your circumstances based on your research. Once you make the decision, don’t look back.